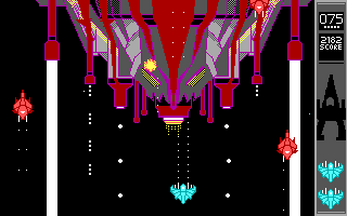 A co-op game about reliving your childhood memories of an 80's space shooter, but facing another type of nostalgia. 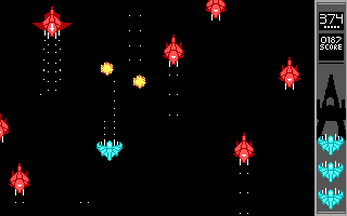 SKYBLAZOR is a vertical shooter developed by GamePunks, Inc., at the time consisting of three friends. The game was developed over the course of 6 months and released to the public in 1989. Interestingly, it was released online under the then-new shareware model, beating developers like Apogee Software, and helped popularize the business practice. The game rapidly became an overwhelming success, and GamePunks found themselves shipping the full, retail game to enthuiastic gamers all of the country. According to one account, the trio made about $100 in income every day. The retail, full version of SKYBLAZOR has been shrouded in infamy and controversy. Its copy protection methods included the usage of two simultaneous manuals and required players to translate fictional languages and decipher codes using contradictory instructions. In a rtrospective penned two decades later, GamePunks admitted it was "a horrible, dangerous business decision" on both the developer's part and their storefront publisher, which required them to implement "advanced and confusing" copy protection methods against their will. 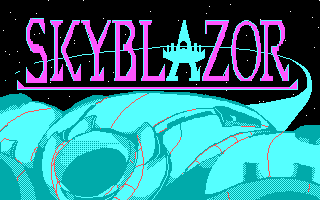 This controversy did not detract from SKYBLAZOR's popularity, and after releasing a few sequels that proved equally successful, the company expanded in an unprecedented pace. With the trio's ambitions ever expanding, they invested all GamePunks' savings on a fully 3D, open world space simulator called Armada Open. The project suffered many delays, personal conflicts and a myriad of design changes, and was released to lukewarm reception in 1996 after 6 years in development. Despite being years ahead of its time in terms of design and ambition, the experimental 3D technology proved to be taxing on home computers and was quickly outshadowed by 3D shooters like Quake. The design choices also failed to resonate with gamers. With the financial failure of Armada Open, two of the original developers left the company. GamePunks shut its doors in early 1998. Two of its original creators have reassimilated into the industry, while one of them left it altogether to pursue a career as a robotics engineer. Today, GamePunks' DOS games are seen as technical marvels and years ahead of their time. They have since gained cult status and the act of playing their games is considered by many to be a nostalgic trip to a simpler time. Their copy protection methods, however, remain an intriguing oddity to this day.